Fibromyalgia is a condition characterized by chronic pain and fatigue. 3-5% of the population suffers with this condition with over 80% being women. This is one of the fastest growing disabling conditions in the US. There are not any specific lab tests or definitive markers for the diagnosis. Instead it relies on a bevy of symptoms and tender points along the body. This article discusses a number of natural solutions for Fibromyalgia. Fibromyalgia is classically diagnosed with positive reaction to 11 of 18 specific tender point sites on the body. Other classic findings include chronic fatigue, sleep challenges, normal blood tests and a history of widespread pain particularly in the neck and back (1). The medical community hasn’t come up with a true defining mechanism of action for fibromyalgia. 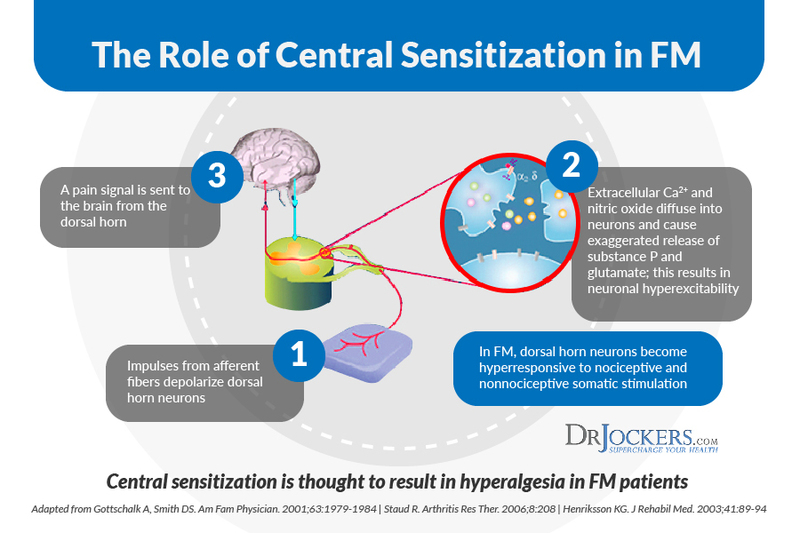 Many have described it as a “central sensitization syndrome” caused by biological abnormalities in the nervous system which act to produce pain and cognitive impairments as well as pychological problems (2). Most scientists believe this is a chronic nervous system sensitization condition of the muscle fascia. This means that the individual has heightened sense of pain and tenderness despite the fact that inflammatory agents are not consistently present (3, 4). When you prick your finger, there is a whole host of sensory information that is processed through the tissue cell, spinal cord and brain in order for you to perceive pain. We all have a certain threshold response that must be overcome in order for us to perceive a painful response. Individuals with fibromyalgia have a very low pain threshold to where very little, if any, stimulus is needed in order to provoke a painful response. One of the major factors associated with fibromyalgia is dysregulation in the Hypothalamic-Pituitary-Adrenal Axis (HPA). This is a problem that occurs when someone has a heightened and ongoing fight or flight stress response. 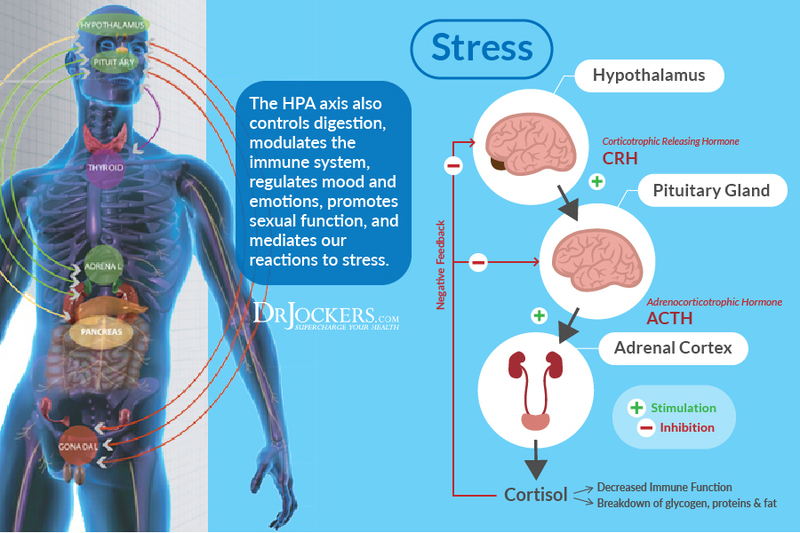 When you are stressed, your HPA axis naturally increases its activity. When this is prolonged it can create long-term issues as these areas fatigue and fail. Individuals with fibromyalgia typically have some sort of a triggering event such as a physical, chemical or psychological trauma. This could be a car accident or fall, a major infection or exposure to a toxic chemical agent or the loss of a loved one, child abuse, spousal abuse, etc. This trauma drives up the HPA axis as it normally should. The problem occurs when these individuals are unable to heal and adapt properly. Most people are able sleep, heal and adapt to the trauma they experience in life. After a few weeks they are much better. 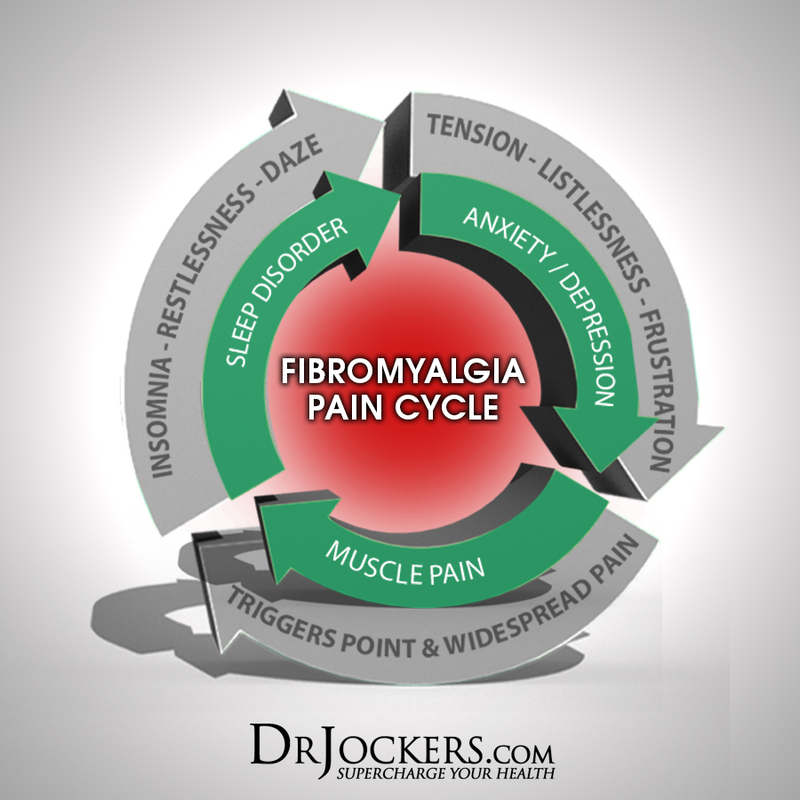 Fibromyalgia occurs when the individual is unable to sleep and heal effectively. The poor healing response leads to increased pain sensations and that only drives up the HPA axis even more creating a viscous cycle where the stress response blocks healing and promotes further stress, pain and poor healing (7). There has been a tremendous amount of research linking the gut microbiome and neurological health. Research has indicated that low levels of healthy lactobacillus and bifidobacterium are linked with increased brain and nervous system excitability and neurological inflammation (8, 9). The research shows that 30-70% of fibromyalgia patients suffer with small intestinal bacterial overgrowth and digestive complaints (10, 11). Some of the most common complaints among fibromyalgia patients include irritable bowel syndrome and indigestion or acid reflux (12, 13). Mold grows in water damaged buildings and can release toxic substances called mycotoxins. These mycotoxins such as afflotoxin, ochratoxins, trichothecenes have delirious health effects on humans and are very rarely tested for or thought of by conventional medicine (17). One study showed that 104 out of 112 (93%) of individuals with fibromyalgia or chronic fatigue syndrome had at least one mycotoxin in their urine. Almost 30% had two or more different mycotoxins in their urine (18). Many of these people had high mold exposure from their home or from their work office. I ask my clients if they feel better when they are on vacation (away from their office and home). If one notices a big change when they are away from their normal surroundings it is a red flag for mold illness. Many individuals with fibromyalgia have heavy metal toxicity. The most common heavy metals associated with this include mercury, aluminum and lead. Risk factors for mercury toxicity include a history of amalgam fillings or one’s mother having amalgam fillings. Additionally, many vaccines used to have mercury and some still do. If you had an old home with lead based paints or have used a lot of lead based lipstick you may have elevated levels. If one is consuming a lot of food out of aluminum cans or using aluminum cookware and getting flu vaccines which use aluminum as a preservative. City based tap water can have high levels of any or all of these major heavy metals. If you have various mineral deficiencies such as low zinc levels, it predisposes you to having higher heavy metal levels. You can get a urine test to look at your heavy metal ratios. Every cell of the body has mitochondria within it that produce energy for the cell. The mitochondria are the battery packs of the cell and they are extremely important. High levels of oxidative stress wear down the mitochondria and cause a dysfunctional state. Studies have linked fibromyalgia with increased oxidative stress and mitochondrial dysfunction (18, 19). In particular, individuals with fibromyalgia have been shown to be deficient in Coenzyme Q10 which is one of the most important free radical scavengers within the cell and a necessary nutrient for the mitochondrial respiratory chain (MRT) (20). Low levels of CoQ10 reduce MRT activity and intracellular oxygenation levels. Treatment with CoQ10 supplementation has been shown to be very successful for improving the symptomatology of fibromyalgia (21, 22). In fibromyalgia, the cells are under so much stress that there main protective shield, glutathione (GSH) gets worn down and oxidative stress damages the mitochondria and the DNA leading to cell death. Poor blood sugar control and high environmental toxin exposure are known to deplete glutathione levels and impair mitochondrial function (23, 24). A key pathway that maintains cellular glutathione levels and the ability of the cell to adapt to stress is called Keap1-Nrf2. When this pathway breaks down it causes increased levels of oxidative stress within the cell that leads to the glutathione depletion and mitochondrial dysfunction (25). Vitamin D deficiency is a significant problem in our society and especially so among fibromyalgic patients. Research shows that there is a correlation between vitamin D levels and the level of pain and symptoms of fibromyalgia to where individuals with lower vitamin D have lower pain thresholds than fibro patients with higher vitamin D levels (26). Adapting to stress and the challenges of life is an aspect that methylation provides the body. Without adequate methylation processes the individual cannot adapt to stress effectively. Research shows that individuals with fibromyalgia have altered methylation processes due to genetic polymorphysims (MTHFR, MTRR, A1AT and COMT among others) and nutrient deficiencies (28, 29). Key methylation elements include methylated B vitamins (riboflavin, B6, folate and B12 in particular), magnesium, selenium, zinc and various trace minerals. Individuals with fibromyalgia are often deficient in these key nutrients and need nutritional and supplemental strategies to address these key methylating agents. Individuals with fibromyalgia may benefit from a low-oxalate diet. 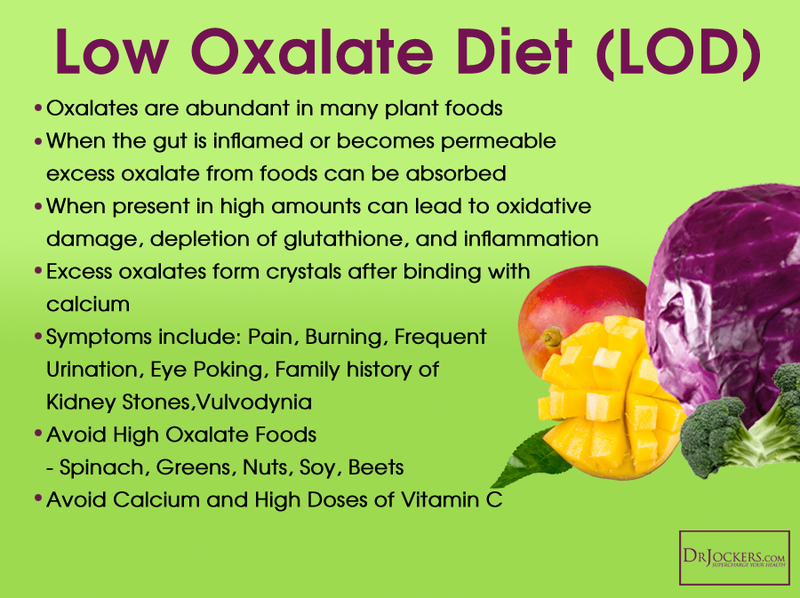 Oxalates are naturally occurring compounds in plants, animals and humans. The body is naturally able to synthesize oxalates from various compounds such as excess vitamin C, fructose as well as yeast. Vitamin B-6 deficiency, magnesium and thiamine deficiency are also ideal circumstances for increased oxalate synthesis. (30, 31, 32). Clinically, I use the Great Plains laboratory organic acid test to determine if someone has elevated oxalates in their system. This is a simple urine test done in the comfort of your own home. This test also lets me analyze for vitamin B6 deficiencies and for Candida overgrowth which are both major causes of hyperoxaluria and common issues involved with fibromyalgia (33, 34, 35). From a functional nutrition and natural medicine perspective this test helps me to determine the cause and best diet and treatment for this condition. Anti-inflammatory foods help to modulate the immune system and reduce inflammatory activity in the body. Great anti-inflammatory foods include coconut products, avocados, olive oil, berries & phytonutrient rich vegetables. Healthy meat sources such as grass-fed beef, wild game, wild salmon, organic poultry and organic eggs are great if the gut can tolerate them. It is advisable for anyone with chronic inflammation to include organic vegetable juices, fermented foods and functional beverages in their diet. Homemade sauerkraut, apple cider vinegar, coconut water kefir, and kimchi are great. Begin with small doses of all of these and add more if you tolerate them well. Powerful herbs such as turmeric, ginger, garlic, onion, rosemary, thyme, cinnamon, & oregano among others should be used as much as possible to improve immune coordination. People with fibromyalgia, chronic pain & fatigue are highly likely to have neurological dysfunction in their upper neck. Subluxation, or neurological interference, at the bottom of the skull, C1 & C2 alter endorphin release into the body. This leads to increased states of pain, fatigue, anxiety and accelerated stress as well as mal-coordinated immunity (36). Well trained chiropractors can analyze these regions of the spine and give specific corrective adjustments to restore balance and optimal neurological expression in these regions. This reduces the stress response and improves endorphin release. This improves the individual’s pain tolerance and overall well-being (37, 38). Here are the best action steps to get started with on your journey to prevent and/or beat Fibromyalgia. You should always consult with your physician before stopping or changing medications or taking on new health strategies. Additionally, you should be working with a functional health practitioner to help guide you through these strategies. This is not an exhaustive list and there are other natural therapeutic strategies that I and functional health practitioners will utilize to help individuals with Fibromyalgia. 2) Test For Food Sensitivities: You can do a biofeedback test to determine what foods are causing stress in your system and an elimination diet to test how you are responding to eliminating certain foods for periods of time. 4) Improve Your Sleep: Sleeping a high quality 8-9 hours each night is key to healing and improving brain function. Follow the steps in this article to improve your sleep. 5) Power Up Your Nrf2 Pathway: This is the key genetic anti-oxidant pathway. Adding in clinical dosages of resveratrol, curcumin, sulfuraphane and Green tea (ECGC) can be extraordinarily beneficial. I use Nrf2 Power here to improve this pathway. I always get my chronic hypertensive patients on Nrf2 Power. 6) Include Magnesium & B Vitamin Rich Foods: Magnesium helps to improve blood sugar signaling patterns and protects the blood-brain barrier. The best magnesium and B vitamin rich foods include dark green leafy veggies, grass-fed dairy, raw cacao and pumpkin seeds. Consume these as tolerated. You can also do Epsom salt baths to boost your magnesium levels. 8) Use Anti-Oxidant Rich Herbs: Add turmeric, ginger, oregano, garlic, basil, thyme and rosemary to as many dishes as possible and drink organic herbal teas on a regular basis. 9) Ground Your Body: In our society we are surrounded by toxic electromagnetic frequency’s (EMF’s). These EMF’s increase stress within our body and alter neurotransmitter function. By going outside daily and walking barefoot on grass, dirt or sand you absorb natural EMF’s from the ground that balance your electrical rhythms. Follow the steps in this article here. 10) Supplement With Omega 3’s: Omega 3 fatty acids and in particular the long chain variety EPA and DHA are critical for stabilizing blood sugar, reducing inflammation and pain. Consume grass-fed meat, grass-fed butter, wild-caught fish and spirulina to get it in your diet. It is also advisable to supplement with 2-5 grams daily of EPA/DHA along with 200 mg of GLA. Clinically, I use ProEFA to boost up omega 3’s. 11) Improve Your Mitochondria: The mitochondria are the energy powerhouses of every cell. When someone has fibromyalgia or chronic fatigue it is a clinical sign that they have dysfunctional activity going on in the mitochondria. Support your mitochondria with clinical doses of CoQ10, L-carnitine, N-acetyl cysteine and Lipoic acid. The supplement I use with my neurodegenerative clients is Brain Supercharge which has the clinically effective dosages of each of these key nutrients and more. 12) See a Chiropractor: Have a full neurological exam and see a high quality chiropractor to help reduce stress on the nervous system and enhance overall well-being. 13) Juice Your Veggies: Juicing is one of the best ways to get high quality anti-oxidants and powerful phytonutrients into your system. Here is my article on Best Juicing strategies. 14) Intermittent Fasting: Going 16 hours between dinner and breakfast is one of the best ways to improve mitochondrial production. Your body improves energy efficiency by increasing and strengthening the mitochondria during periods of fasting. This is also one of the best ways to reduce oxidative stress and inflammation. Consume your meals in an 8 hour window such as 11am – 7pm. Read this article for more info on fasting. 15) Optimize Your Vitamin D: Low vitamin D3 is associated with neurological inflammation and neurodegenerative conditions (37). Be sure to increase your vitamin D through good amounts of regular sun exposure and/or taking a high quality vitamin D3/K2 supplement. 16) Practice Oil Pulling: Oil pulling helps to reduce the microbial load in your mouth. This takes stress off of the immune system and reduces inflammation levels throughout the body. Read more about oil pulling here and practice this 2x daily. 18) Use Essential Oils: The anti-oxidant content and aromatherapy benefits of essential oils help to improve oxygenation and reduce the harmful effects of oxidative stress throughout the body. Some of my favorites include lavendar, peppermint, chamomile and sweet orange among others. Put a drop on your hands and mix together and then cover your nose and inhale the healing vapors. This will stimulate your brain and increase blood flow to your cranium. 19) Low Intensity Movement: A sedentary lifestyle reduces cerebrospinal fluid flow and can lead to increased oxidative stress in the brain. Throughout the day, get a lot of low-intensity movement such as walking, light cycling, playing, etc. Regular movement will help reduce inflammation and boost the development of new neurons in the brain. 20) Improve Your Gut Motility: Improving bowel movement frequency and consistency is a key detoxification concept. Consuming an anti-inflammatory diet with good fiber sources such as chia seed and flax seed, using bone broths, fermented foods and probiotics will improve bowel motility. 21) Use an Adrenal Support Pack: Individuals with fibromyalgia and chronic fatigue syndrome have extreme adrenal fatigue. This causes low energy, poor sleep and central sensitization. Certain nutrients can help dramatically improve the bodies ability to adapt to stress. I have put together my adrenal support pack with the highest quality nutrients for strengthening the adrenals and our ability to rest and heal effectively. 8. Bhattacharjee S, Lukiw WJ. Alzheimer’s disease and the microbiome. Frontiers in Cellular Neuroscience. 2013;7:153. 9. Hill JM, Bhattacharjee S, Pogue AI, Lukiw WJ. The Gastrointestinal Tract Microbiome and Potential Link to Alzheimer’s Disease. Frontiers in Neurology. 2014;5:43. 18. Brewer JH, Thrasher JD, Straus DC, Madison RA, Hooper D. Detection of Mycotoxins in Patients with Chronic Fatigue Syndrome. Toxins. 2013;5(4):605-617. 25. Harvey CJ, Thimmulappa RK, Singh A, et al. Nrf2-regulated glutathione recycling independent of biosynthesis is critical for cell survival during oxidative stress. Free radical biology & medicine. 2009;46(4):443-453. Do you have recommendations for specific strains of probiotics that are helpful for fibromyalgia and muscle pain? Also can you take omega 3 and 6 together. I read that they compete for the same pathway and need to be taken separate but my life would be a lot easier if I could take them together! !